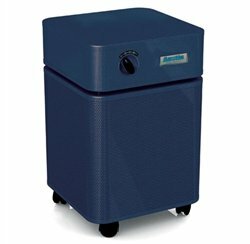 Austin Air Standard Plus Unit Healthmate Plus Room Air Purifier – Midnight Blue , selling for $648.99 USD brand new. Manufactured by Austin Air. There are 10 units left brand new. Specialty air cleaner specifically designed for those who are chemically sensitive. Has 60 sq. ft. of medical HEPA, certified to remove 99.97% of airborne particles 0.3 microns or larger. Contains 15 pounds of granular carbon and zeolite for the adsorption of odors, gasses, and chemicals. The carbon in this filter is impregnated with potassium iodide for the removal of additional chemicals. Stands 23″ tall and 14.5″ wide. Comes with wheels for easy portability. Effectively cleans an area of 1500 sq. ft. (with normal ceiling heights). Designed for the toughest air contamination conditions. Extremely effective at removing particles in the air including dust, pollens, and smoke elements. An exceptional capacity for removing Volatile Organic Compounds (VOCs). Removes viruses and bacteria.